This classic turtleneck pullover will make your EID Model Man a standout at meetups and in photoshoots -- plus it's vegan- and allergy-friendly, as well as easy-care for all kinds of outdoor activities. The cable accent on both sleeves adds a seafaring swagger to those broad resin shoulders. I knitted Mariner from a high-quality 100% acrylic yarn, "Marble" by James C. Brett. This colorway is a tweedy mix, with one strand of deep teal blue and a color-shifting strand in seaweed greens and stormcloud grays. I added a snap placket in back for easy dressing. If need be, Mariner can be gently machine-washed and tumble-dried (preferably inside a lingerie bag or pillowcase). Mariner is my own design, with plenty of inspiration from traditional knitting techniques and Elizabeth Zimmermann's EPS. It is sized to fit Iplehouse EID Model bodies. 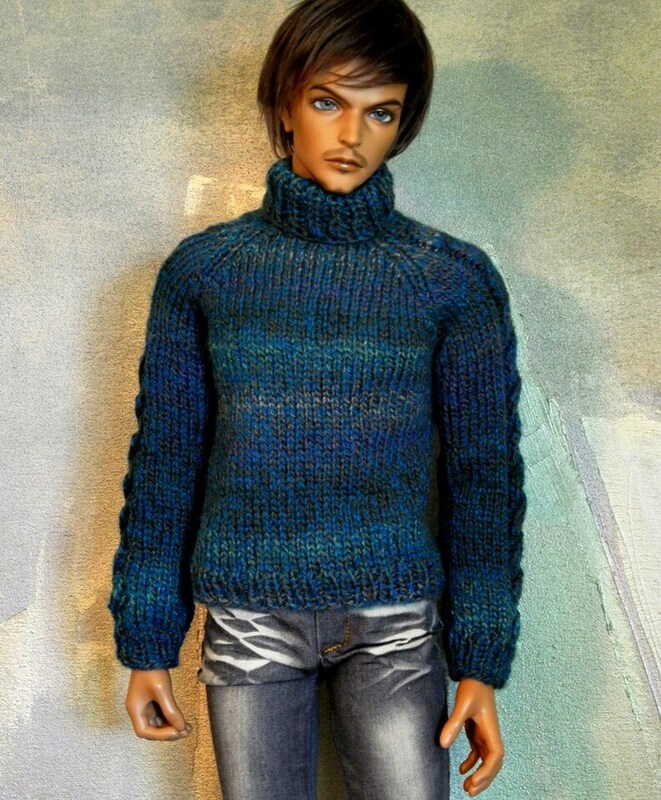 Similar-sized BJDs such as Angelheim Elderheim. Dollshe 28M, and Soom Idealian can also wear it, but I don't believe there will be enough room for the EID Superhero body's muscles, sorry. My model (not for sale) is Aneurin, an EID Model Tedros. He is wearing his own jeans, also not for sale.